C++'s Standard Template Library is revolutionary, but learning to use it well has always been a challenge for students. 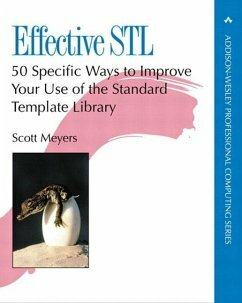 In Effective STL, best-selling author Scott Meyers (Effective C++, More Effective C++) reveals the critical rules of thumb employed by the experts -- the things they almost always do or almost always avoid doing -- to get the most out of the library. This book offers clear, concise, and concrete guidelines to C++ programmers. While other books describe what's in the STL, Effective STL shows the student how to use it. Each of the book's 50 guidelines is backed by Meyers' legendary analysis and incisive examples, so the student will learn not only what to do, but also when to do it - and why.